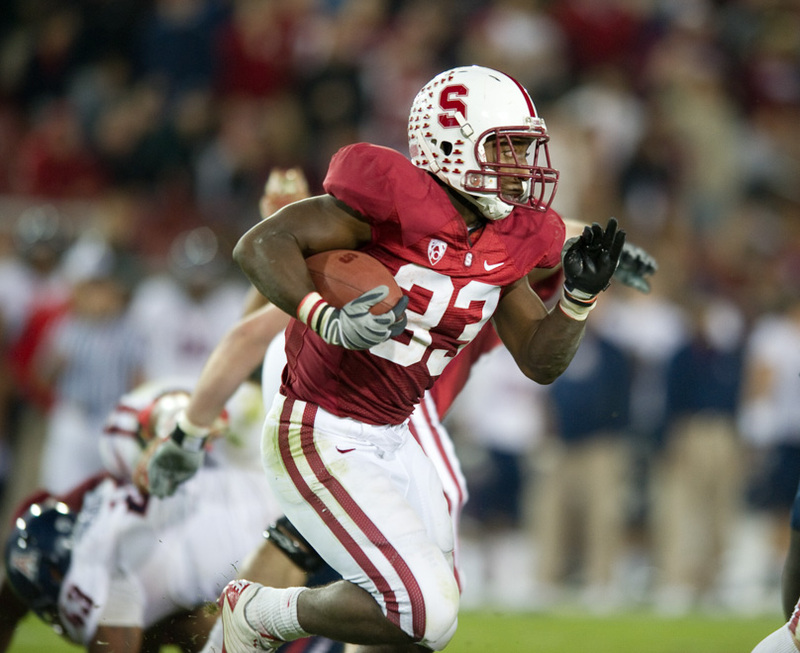 STANFORD, CA - November 6, 2010: Stefan Taylor runs for yardage during a 42-17 Stanford win over the University of Arizona, in Stanford, California. Stanford’s 21-3 win over Cal in 2012 does not entirely reflect how dominant the Cardinal truly were that day. While Stanford rushed for 252 yards as a team, the Bears only rushed for 3 yards total, which came off 28 carries. The Cardinal running game was led by senior Stepfan Taylor, who rushed for a career-high 189 yards and 1 touchdown. Taylor helped Stanford jump out a 7-0 lead in the first quarter on a 7-yard score. The Cardinal would then put the game out of reach in the second quarter with two passing touchdowns, one coming from Kevin Hogan and the other from starter Josh Nunes. The Stanford defense shut down the Bears’ offense with 4 sacks, 3 fumbles and 1 interception. If not for Nunes’ own fumble and interception, coming in the first and fourth quarter respectively, the score would have been more lopsided. The 2013 matchup was a career day for quarterback Kevin Hogan and wide receiver Ty Montgomery. Hogan set career highs with 329 passing yards and 5 touchdowns, 4 of which went to Montgomery. The senior Montgomery also rushed for a touchdown, giving him 5 total on the day and matching a Stanford record. Montgomery scored the first four times he touched the ball, giving Stanford a commanding 28-10 lead early in the second quarter. Hogan also connected with receiver Michael Rector in the second quarter on a 45-yard touchdown pass. By halftime Stanford was up 42-13, and the Cardinal did not take their foot off the gas, scoring three more touchdowns in the second half. Stanford totaled 603 yards on offense on the day, while Cal mustered 383. Stanford’s 63 points were the most any team has scored in Big Game history, and the 50-point win margin was also a record for the rivalry. In 2014 running back Remound Wright matched the heroics of Ty Montgomery’s 2013 performance. Wright only rushed for 92 yards, but found the end zone four times. Wright scored a touchdown in each quarter and opened the game with a 1-yard score on the first drive. Hogan had a huge drop-off from his career-best performance in 2013, only throwing for 214 yards and an interception, but the Cardinal did not need to rely on the passing game. With Wright’s consistent ability to get into the end zone, Stanford jumped out to a 24-7 lead at halftime and never looked back. The Stanford defense once again fed off turnovers, forcing 2 interceptions and 3 fumbles.